MEF18 Proof of Concept, 29 - 31 Oct - Data Science Applications for LSO Architecture-Based Service Fulfillment and Assurance. PoC Participants: CenturyLink and Infinera. Speaker: Sharfuddin Syed, Distinguished Engineer, Infinera. This PoC focuses on how to build artificial intelligence and cognitive analysis into the network in order to enable complex networks to be managed automatically. The PoC demonstrates alignment with existing LSO Presto API and emerging LSO Allegro API work. In addition, this PoC provides a jump-start for future LSO Interface Profile specification, LSO API/SDK, and micro-service development in support of service assurance functionality. MEF18 Proof of Concept, 29 - 31 Oct - SDN Orchestration for Edge Clouds. PoC Participant: Juniper Networks. Service providers have identified their edge infrastructure as a means of deploying services in advance of 5G deployments. With space, power, and connectivity constraints, the solution is to create “edge clouds” that utilize OpenStack and Kubernetes combined with highly-scalable SDN platforms with integrated automation, virtualization, programmability, and security. This PoC demonstrates the ability to instantiate a small footprint, edge cloud on a small compute device. A seamless fabric is established between the SDN data plane at the edge to a centralized management and orchestration instance running on a public cloud. This demonstration shows a single control point for all distributed workloads, acting as an SDN controller for both VM and container orchestration. MEF18 Proof of Concept, 29 - 31 Oct - Zero Touch Automation for SD-WAN + SECaaS + Virtual Cloud Exchange (VCX). PoC Participants: Tata Communications and Fortinet. Speakers: Nicolas Thomas, Consulting Systems Engineer, Fortinet and Vineet Anshuman, Global Product Manager, Tata Communications Transformation Services. The PoC goal is zero touch automation for SD-WAN with Security as a Service and Virtual Cloud Exchange for seamless connectivity to public cloud. The idea is to prove that we can operate in a fully automated service deployment in the cloud as well as multiple branches with secured SD-WAN at the same time. This is zero touch and TOSCA model-driven within the LSO Framework. A typical use case is: a large, regulated mutli-national enterprise wants to do a confidential townhall live. We will deploy the streaming service and SD-WAN adaptations in the branches from one model to allow a good latency and priority on the day for live streaming. Then another model will change the priority for the replay of the video when normal business resumes. Fortinet is leading the Security-as-a-Service group in MEF. This is part of the MEF 3.0 SD-WAN sub-committee that is helping shape a fully automated, cross-service provider, software-defined federation of capabilities in order for telcos to provide end-to-end protection and service quality to their end customers. Tata Communications Transformation Services (TCTS), a 100% subsidiary of Tata Communications Ltd, provides leading business transformation, managed network operations, network outsourcing and consultancy services to telecommunication companies around the world. TCTS delivers operational efficiency, cost transformation and revenue acceleration solutions for all the stages of the carrier process lifecycle, including but not limited to network engineering and design, implementation and operations functions. Qualcomm and Nokia achieved over-the-air (OTA) 5G NR data calls in both the mmWave and sub-6 GHz spectrum bands. The calls were compliant with the global 3GPP 5G NR Release 15 specification in NSA (Non-Standalone) mode. The testing was performed at Nokia’s 5G center of excellence in Oulu, Finland using commercially available Nokia AirScale base stations and a mobile smartphone form-factor test device powered by the Qualcomm Snapdragon X50 5G modem and antenna modules with integrated RF transceiver, RF front-end and antenna elements. In February 2018, Nokia and Qualcomm Technologies first completed key 3GPP-compliant 5G NR interoperability testing in the 3.5 GHz and 28 GHz spectrum bands using a commercially available Nokia AirScale base station and device prototypes from Qualcomm Technologies. The OTA calls are key steps in enabling customers in the 5G ecosystem to launch commercial networks and mobile devices from early 2019 onwards, in the United States, Korea, Europe, Australia, Japan and China. Verizon and Samsung will launch their first commercial 5G smartphones in the first half of 2019. Verizon has previously disclosed plans for its 5G mobility service to live in early 2019 and expand rapidly. It already has a fixed 5G residential service in parts of Houston, Indianapolis, Los Angeles and Sacramento. Qualcomm is hosting its annual Qualcomm Snapdragon Technology Summit in Maui this week where a prototype will be unveiled. The unit will be powered by the upcoming flagship Qualcomm® Snapdragon Mobile Platform with the Snapdragon X50 5G NR modem and antenna modules with integrated RF transceiver, RF front-end and antenna elements. Telia activated pre-commercial 5G in the city of Vantaa, just outside Helsinki, where the airport is located. Telia, in cooperation with airport operator Finavia, is launching a 5G network at the Helsinki Airport and starting a robotics project. The idea is to use 5G in airport operations and bring new kinds of experiences to passengers. The project means that Finavia will be Telia’s first customer using the pre-commerical 5G network in Finland. The 5G robot operates in the non-Schengen area of T2 terminal. "The robot can deliver real-time video stream from the terminal and enable for example monitoring the terminal area through remote or autonomous control and see that everything is running as it should. The robot can also guide passengers in the terminal, and we aim to try different use cases during the project,” says Heikki Koski, Chief Digital Officer, Finavia. In November, Telia, in partnership with Nokia, is launched a pre-commercial 5G network in the city of Oulu, Finland. A 5G ecosystem will be built in the Nuottasaari industrial area in Oulu. The area will be one of the world's first industrial 5G environments. In September, Telia activated its first 5G base stations in Helsinki. Telia's 5G network operates on test frequencies issued by the Finnish Communications Regulatory Authority. Full-scale commercial operation will be possible in 2019, after the 3,5 GHz 5G frequency auction has been conducted in Finland. NTT Communications is expanding its DDoS Protection Services (DPS) with the addition of DPS Max, its most advanced tier of service for Global IP Network (GIN) customers that require full protection from DDoS attacks, including attack detection and auto-mitigation capabilities. NTT Com’s DPS product suite also includes DPS Control, DPS Core and DPS Detect. DPS Control is an entry-level tier of service intended for customers that don’t require full mitigation assistance. DPS Core is the initial level of service for customers that need full DDoS mitigation support. DPS Detect provides an advanced level of service as it adds detection capabilities to help identify potential attacks using state-of-the-art technology while working with customer-defined thresholds. The evolution of advanced foundry technologies will be crucial to enable the design and manufacture of innovative semiconductors for AI, cloud computing, autonomous vehicles, and smart home applications, said Dr. ES Jung, president and head of Foundry Business at Samsung Electronics, speaking at the 2018 IEEE* International Electron Devices Meeting (IEDM). Dr. Jung introduced some of recent research and development in future silicon technology, including MRAM, a non-volatile memory solution embedded in conventional logic process, and 3nm Gate-All-Around (GAA) technology. Samsung calculates that MRAM will be far more power efficient than conventional technologies, consuming only 0.5% of power compared to SRAM at 1,024Mb. MRAM also has smaller cell area, which allows design flexibility. Samsung's unique GAA technology called Multi-Bridge-Channel FET (MBCFET) uses vertically stacked multiple nanosheet channels. With variable width of nanosheet, this technology provides not only optimal performance and power characteristics but also high design flexibility. Furthermore, MBCFET is fabricated using 90% or more of FinFET process with only a few revised masks, allowing easy migration. Also with one of its newly published papers at 2018 IEDM, Samsung Electronics shared the development progress of 3nm, a successful demonstration of fully functioning high-density SRAM circuit. The development of Samsung's first process node applying MBCFET technology is on schedule. Tely, a leading Brazilian telecommunications company, has deployed Infinera's Groove G30 Network Disaggregation Platform to cost-efficiently scale its optical transport infrastructure in response to customer traffic growth and the connectivity demands of new end-user applications. Tely’s customers include leading enterprises, service providers, and Tier 1 carriers, as well as residential consumers. With a presence throughout Brazil’s major northeastern states and in São Paulo, Tely offers a wide variety of resilient and secure connectivity services including Gigabit Passive Optical Networks (G-PON), dedicated internet, and local area network (LAN)-to-LAN interconnect. Tely deployed the Groove G30 to scale high-traffic routes and provide 100G and 200G interconnect services. Infinera said the Groove G30 enables Tely to expand current network capacity by 20 times while reducing operational and capital expenses by up to 40 percent with an ultra-compact, low latency and power-efficient optical transport solution. This deployment marks one of the first 200G services in Brazil and represents one of the largest optical infrastructure deployments within the states of Ceará, Rio Grande do Norte, Pernambuco, Alagoas, Paraíba, Sergipe and Bahia. 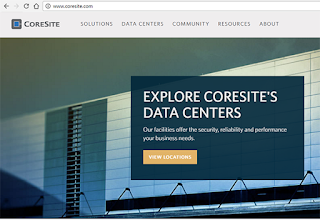 CoreSite Realty Corporation announced the availability of private connectivity to Microsoft Azure ExpressRoute cloud services at CoreSite’s data centers in the Silicon Valley and Northern Virginia markets. The CoreSite Silicon Valley portfolio includes seven operational data centers with an additional facility under construction, providing colocation solutions to one of the largest concentrations of Internet and technology companies in the world. 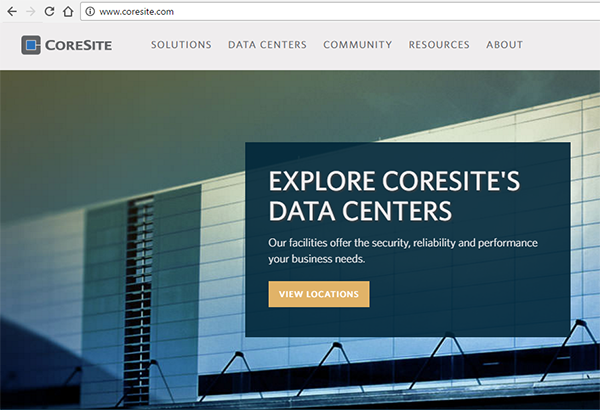 More than 185 international and national carriers, social media companies, cloud computing providers, media and entertainment firms, and enterprise customers connect to do business in CoreSite’s Silicon Valley data centers. The CoreSite Northern Virginia portfolio includes multiple operational facilities across Washington, D.C. and Reston, VA. CoreSite’s recent growth in the market, including the addition of DC2 and VA3, will create a total footprint of over 1,096,000 square feet of colocation data center space upon full build out. HUAWEI CLOUD announced the global launch of its Blockchain Service (BCS). The service helps global enterprises and developers create, deploy, and manage blockchain applications quickly and at minimal cost on HUAWEI CLOUD. BCS is a cloud service that capitalizes on the advantages of HUAWEI CLOUD's container and security technologies, among others. Huawei notes that Blockchain is inherently decentralization, tamper resistance, and traceability, and builds trust between transaction participants. Arlo Technologies, the wireless networking company that spun out of Netgear earlier this year, trimmed its business outlook and guidance for the fourth quarter of 2018 . The company cited delays in shipping its new flagship wire-free security camera system, Arlo Ultra, which had been expected to hit the market in late November 2018. However, Arlo discovered a quality issue with the battery from one of its suppliers, leading to a delay in shipments. The company now anticipates that Ultra will begin global commercial distribution in January of 2019. “While we are disappointed to delay sales of our exciting new product, Ultra, customer satisfaction is our number one priority and we took action to ensure we continue to bring the best products to the market. Arlo is a leader in the market not only because of our incredible product feature set and ease-of-use, but also our quality and reliability,” said Matthew McRae, Chief Executive Officer of Arlo Technologies, Inc.